Frances Lennard, Professor of Textile Conservation. Many congratulations to our new graduates! 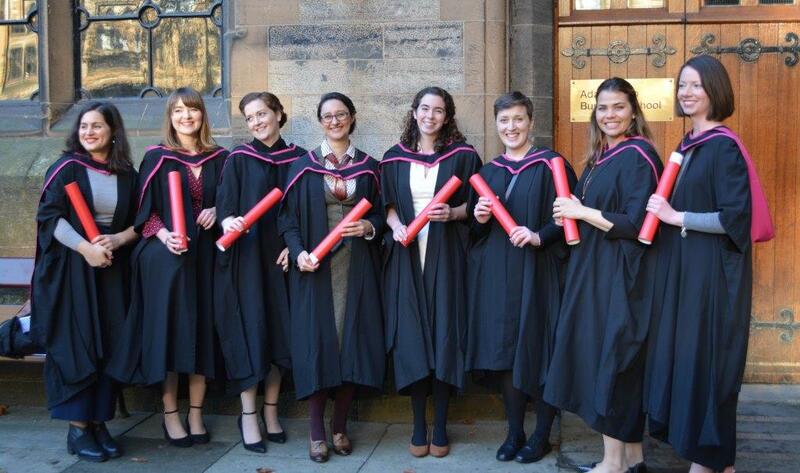 From left to right: Ruby Antonowicz-Behnan, Rosie Nuttall, Lorna Rowley, Keira Miller, Beth Knight, Bevan O’Daly, Cristina Prelle and Aisling Macken © University of Glasgow 2017. 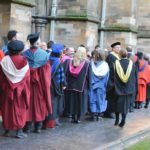 The graduation ceremony for mainly postgraduate students in the College of Arts was held earlier this week, and it was very exciting to welcome the entire class of 2017 back to Glasgow for the occasion, the first time that a whole cohort has been able to attend. Although it is only a few short months since the graduates completed their studies, they have all entered new worlds of work or internship and their student days probably seem far distant now. Despite this, the former students travelled from as far away as the USA and a short contract in Taiwan in order to be here, while others had less far to come. Graduation is a very grand occasion, held in the Arts and Crafts splendour of the University’s Bute Hall and is a fitting tribute to the students’ hard work and determination so it is always a pleasure for us to be able to welcome family and friends to share their achievement. It was a glorious winter day with sunshine illuminating the grand East Quadrangle, part of the Scottish Baronial Main Building designed by Gilbert Scott in the late 19th century, a fitting backdrop for the academic procession which was led by the University piper. The ceremony was followed by a reception for graduates, friends and family in History of Art. 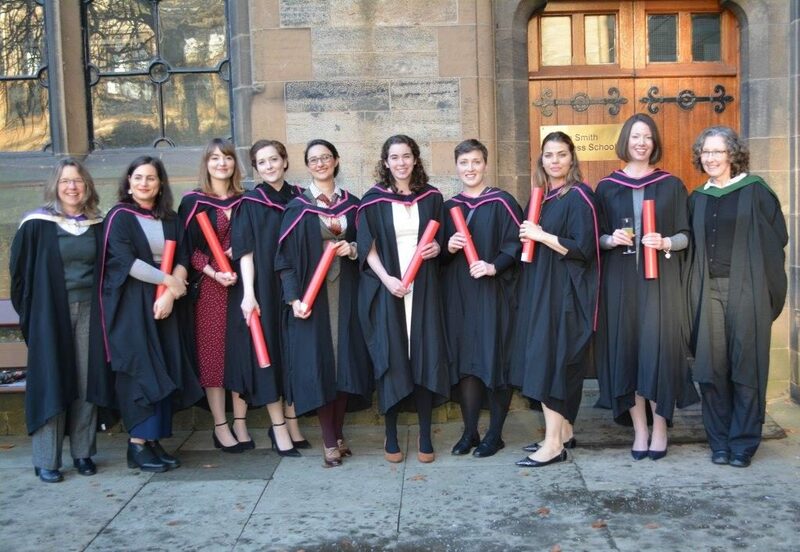 The class of 2015-17 with Karen Thompson and Sarah Foskett © University of Glasgow, 2017. We wish our new graduates all the best in their future careers and hope they will keep in touch (and we will welcome their future contributions to the blog!). What a very exciting celebration, congratulations to everyone, Staff and Students.